This unique take on Batman shows how shadows can be used to create the hero’s face. Done entirely in black, it depicts two hands as they create the shadow such that it forms the superhero’s side profile. 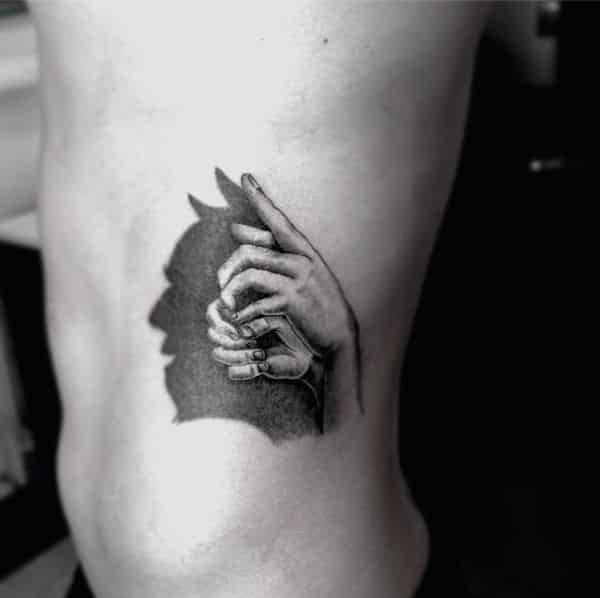 One of the most popular Batman tattoos, this is as simple as it is awesome. With the Batman logo emblazoned on the back, it shows how there is a hero inside everyone. Done entirely in black ink, it creates a striking contrast against the bare skin to ensure that the tattoo stands out. 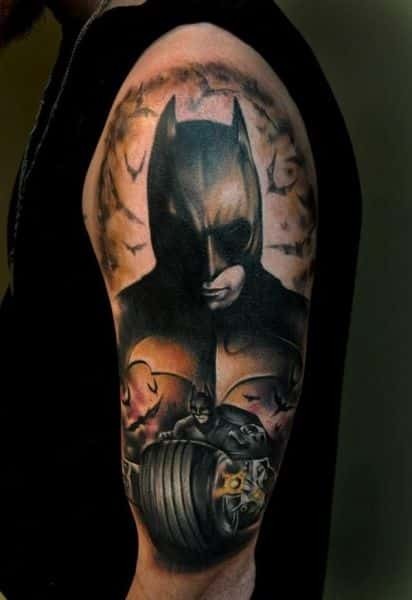 This is a wonderful Batman tattoo for men. Depicting the Batman logo in all it’s simplicity, it is small yet striking in appearance. The solid black coloring gives rise to a distinct contrast against the bare skin. The tattoo represents how we all have a little bit of the hero in us. 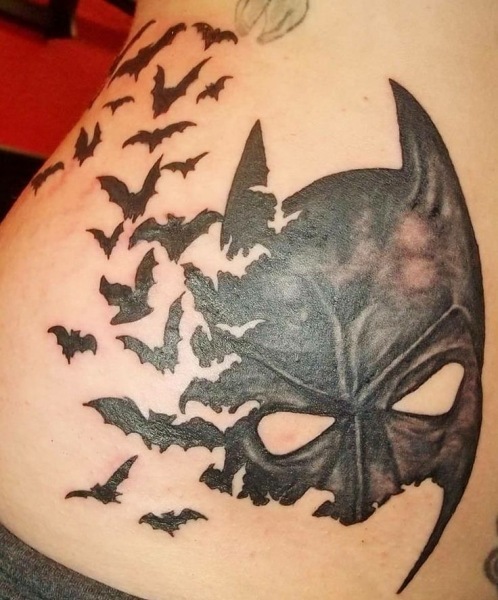 This unique black-ink tattoo shows the mask of Batman as it disintegrates into a colony of Bats flying off into the night. Due to detailed shading, the mask appears extremely realistic. Moreover, since each of the Bats represents the hero himself, it promises safety in the darkness. 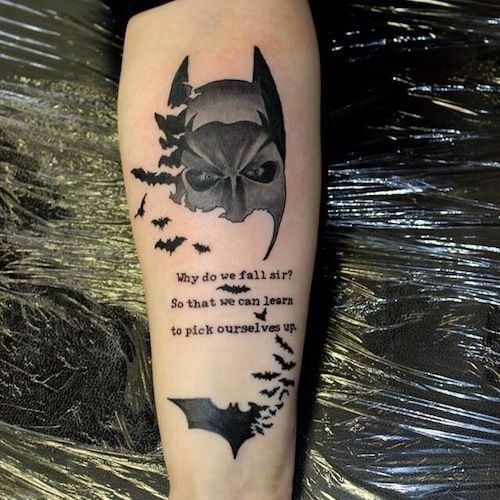 This tattoo depicts the most inspiring words spoken throughout the Batman comics. Even as Bruce Wayne is ready to admit defeat, Alfred comes to the rescue with his ever-lasting wisdom. So if you need some uplifting words to brighten up your days, this is the tattoo for you. 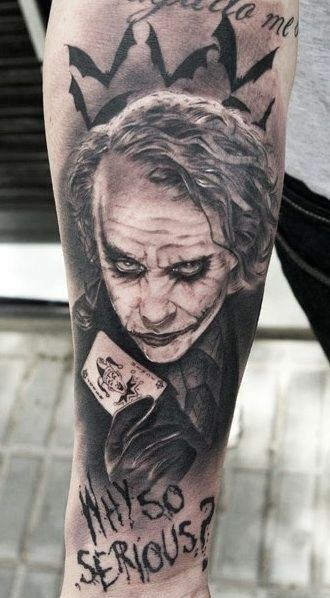 For all the Joker fans out there, this is the tattoo you’ve been waiting for. Done entirely in shades of black, it is a portrait of the super-villain as he holds his signature card in hand. Below is his well-known phrase, ‘Why so serious?’ and in the background is a colony of bats. This shoulder tattoo is done predominantly in shades of black with splashes of yellow and red in the mix. Here, the shadowy silhouette of the superhero looms in the background even as you see him in action on the Batcycle at the bottom. 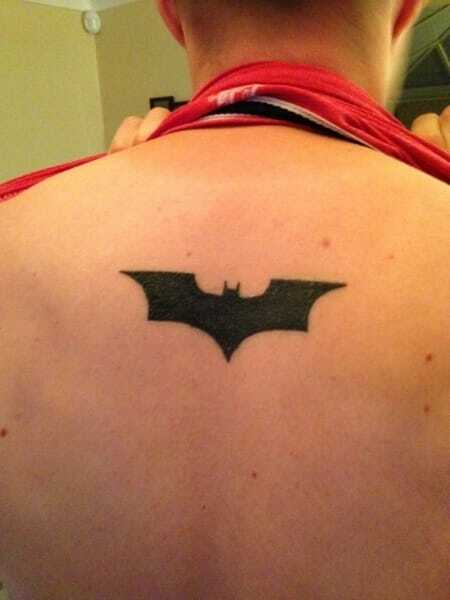 Batman is out to get you, and nothing shows it better than this tattoo. Done predominantly in black ink, it uses shades of gray to create a realistic appearance. The dark coloring leads to a sharp contrast with the surrounding skin. Keeping it simple, this awesome Batman chest tattoo portrays the iconic logo alone. Done in solid black ink, it forms a wonderful contrast with the unmarked skin around it. It depicts the hero that resides within us all, even if we aren’t aware of it. 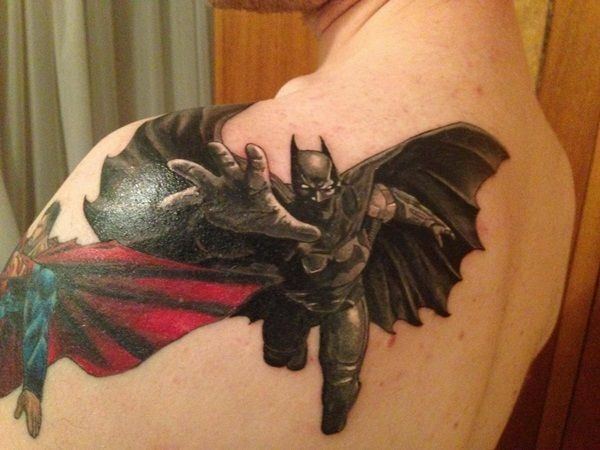 The savior of Gotham city stands vigilant in this brilliant tattoo. Here you see the Batman logo with the hero in the forefront. 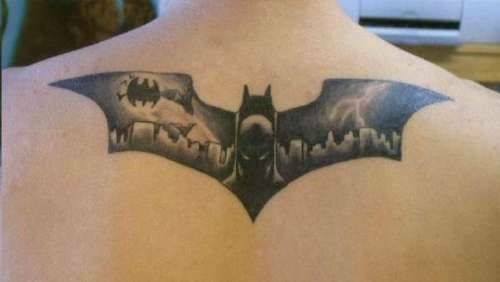 The background shows the skyline of Gotham as the Bat signal shines bright in the sky.